Blekko, a search engine, isn’t exactly a flashy new startup. There’s the name for starters – it was something they came up with as a placeholder while they were stealth and decided that was a good long term name, too. And then there was the whole Cuil fiasco. Which would make any new search startup blanch. So Blekko hasn’t turned on the hype machine at all. They’re just quietly doing their thing, and growing nicely. Now, though, they’ve gone Hollywood. 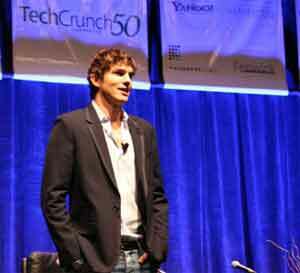 Ashton Kutcher (image is from TechCrunch50 2008), whose movie is currently no. 1 in box offices, is making a somewhat more geeky splash today. He’s invested $200,000 in Blekko, as an extension to the company’s most recent round of funding. You can follow Ashton’s activities on Blekko here. The company has raised around $25 million in debt and equity capital to date.